Colorado’s Kennedy Leonard goes to the basket on Oregon’s Mallory McGuire last month. Photo by Cliff Grassmick. 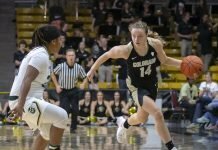 Colorado was clinging to a 48-47 lead over Utah on Jan. 25 when Kennedy Leonard used a lesson she learned during the summer to come up big in a clutch situation. 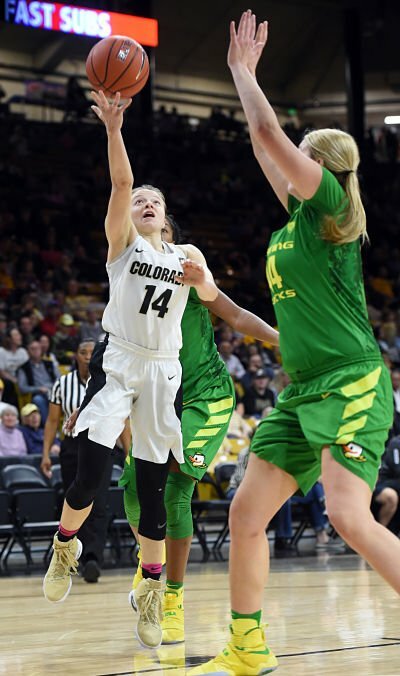 The Buffaloes’ sophomore point guard had been hesitant to take the open pull-up jumper the Utes were giving her that night in the Coors Event Center. Then, maybe subconsciously, she decided to stop being “stubborn” and took – and hit – an elbow jumper with 33 seconds left that gave the Buffaloes breathing room and an eventual 54-49 victory to snap a five-game losing streak. 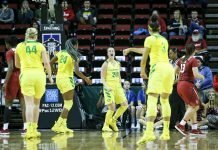 Leonard may be called upon for her shooting touch tomorrow, as Colorado faces Washington State in the first round of the Pac-12 Tournament. But that talent is still new to her. Taking and making pull-up shots was part of her growth during last June when she was a member of Great Britain’s under 20-team. And it showcased, even in a small way, how important that experience was for the Buffaloes’ rising star. The experience overseas also prepared Leonard, who was named to the All-Pac-12 freshman team and received honorable mention all-Pac-12 after scoring 12.1 points and dishing out 4.6 assists, for an increased scoring role under first-year coach JR Payne. “I think it really helped her grow,” Payne said. “It kind of prepped her for this season where she needed to score the ball more because on that team, I think she averaged 24 a game or something. That team needed her to score. She was hands down their best player and had to do a lot. Leonard delivered this season, finishing the regular season averaging 17.1 points and 5.7 assists per game as Colorado went 15-14 overall and 5-13 in the ultra-competitive Pac-12. 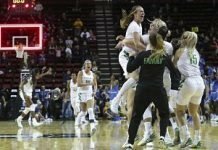 While she has shown and embraced the ability to score in bunches – Leonard scored the final 11 points of the game against Utah and dropped 22 point in the fourth quarter, including the final 20 for Colorado, in an 82-75 loss to Wyoming to close out the nonconference season – Leonard would much rather be more of a facilitator for her teammates. Leonard completely agrees with her coach. That may be one reason Leonard, although only a sophomore, was a team captain this season. Payne describes Leonard as a quiet leader and the hardest worker on the team. “She genuinely loves the game of basketball and it shows by how hard she works,” Payne said. The coach gave an example from earlier last week when Leonard was under the weather a bit and had to sit out a practice. It didn’t go over well with the competitive Leonard. She said sometimes her competitive nature doesn’t produce the results she wants as far as being a team leader. “I’m working to do it in a light that is positive, especially in the heat of the moment,” Leonard said. “As a competitor, if someone makes a mistake or I make a mistake in a game that comes down to one possession I can get flustered and that kind of thing and I think that comes with age and time and maturity. Leonard knows she has room to improve as a leader and has been taking an introduction to leadership course this term. This past year has been a learning experience for Leonard, and it began in earnest with the opportunity to play overseas. She learned to become more comfortable in different settings – on and off the court – and how to adapt in both. “It taught me that adversity will strike, but it’s how you respond that matters,” Leonard said. She also learned how great of an opportunity she has to play in the Pac-12, how great of a support system she has and to be grateful for all of it. While the present has been good, the future looks even brighter for Leonard and the Buffaloes.